The Best Pasta Salad Recipe with Italian Dressing has simple ingredients you have in your pantry. An easy DIY recipe idea that will quickly become a favorite. Howdy, everyone! It’s Anita from The Flamingo Chronicals. This recipe is one of my most used. You really can use it for any occasion. Going to a potluck? Take this along. Are the Teenagers having a slumber party at your house? They will love this. Need a last minute side for a casual dinner, this will be great! When you are ready to serve, chop up your additional ingredients into bite-size pieces. Really anything you have on hand, that you like, will be perfect. Seriously, throw the whole pantry in there! Toss everything together in a bowl, add more dressing as needed and serve up in some pretty dishes. Add some Parmesan cheese to the top and you will be golden. Trust me, everyone will love this. If you have any leftover, toss it in the fridge and eat it for lunch tomorrow when you can have all of it for yourself. This recipe is one of my most used. You really can use it for any occasion. Going to a potluck? Take this along. Are the Teenagers having a slumber party at your house? They will love this. Need a last minute side for a casual dinner, this will be great! 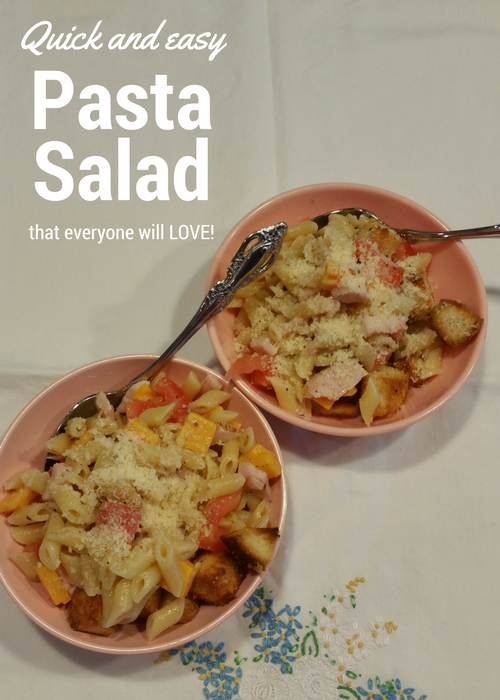 SAVE HOW TO MAKE THE BEST PASTA SALAD EVER – QUICK AND EASY RECIPE TO YOUR FAVORITE DIY PINTEREST BOARD! Looks delish, my family love pasta so much. Thanks for sharing at Inspiration Galore Project Pty. Sharing! Thanks for stopping by. I’m glad I could send a little pasta inspiration your way!